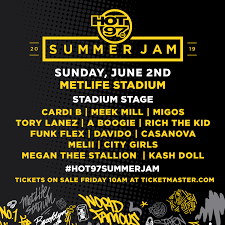 Davido, Cardi B, Meek Mill to perform at New York’s Hot 97 Summer Jam – Royal Times of Nigeria. Davido, Nigerian Afro-pop star, has been enlisted among the global artistes to perform at the 2019 Hot 97 Summer Jam in New York. The event, said to be one of the biggest musical concerts held during the summer in the United States, is to hold on the June 2, 2019, at New York’s Metlife Stadium. Among the artiste enlisted alongside Davido include Cardi B, American rap star; Meek Mill, US-based rapper and song writer; Casanova; Funk Flex, American disc jockey; Kash Doll and Tory Lanez. In reaction to the development, Davido took to his Instagram page to call himself the “Big Fish” to express his excitement to be enlisted alongside global stars in the entertainment industry.